Aircall creates powerful cloud-based phone systems for sales and support teams. See how you can use AirCall to manage your team’s VOIP support in Kustomer. 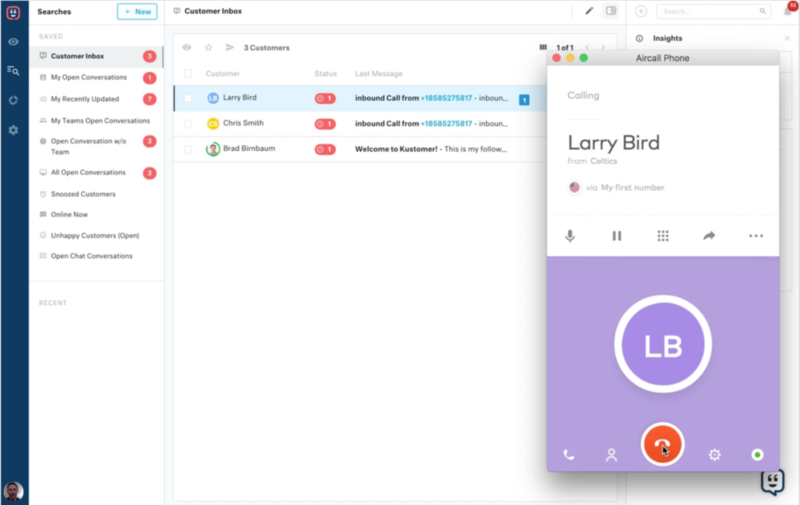 Aircall allows customer support agents to manage inbound or outbound calls and automatically build a customer profile in Kustomer. When a customer calls through Aircall, Kustomer loads the customer’s timeline for review and creates a note draft to take notes on the conversation. Agents can also see a record of missed calls or voicemails, and add comments to existing calls during or after they are completed. Agents automatically get the context of the inbound caller and can record events that happen during the phone call. They can review any previous inbound or outbound customer messages sent through email, text, chat, or Facebook Messenger, all without having to leave the Kustomer platform. Check out our knowledge base article to learn more. Integration apps and solutions are built using the Kustomer API and generally connect third-party products to the Kustomer platform. Join our community. Submit your integration. Our customers use and extend Kustomer every day by building integrations using our API. Go ahead, start building with Kustomer.